A GREAT LASTING GIFT - Gangster movie collectible. Showcased in the double mat, professionally framed in the custom made modern scratched gold wood frame with the famous quote on the plaque "SAY HELLO TO MY LITTLE FRIEND". It is shipped completely ready to be hung on the wall. 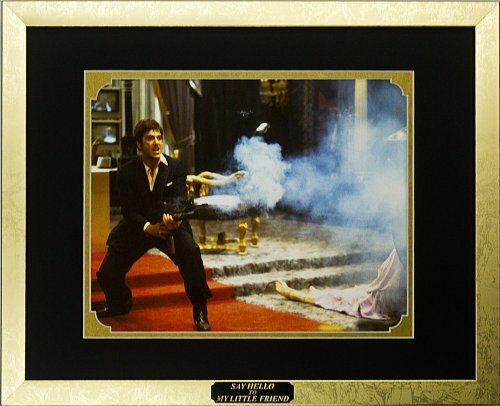 Plaque says "SAY HELLO TO MY LITTLE FRIEND"
If you have any questions about this product by Movies collectibles, contact us by completing and submitting the form below. If you are looking for a specif part number, please include it with your message.